Savard recorded a game-high six blocked shots while adding one shot, one hit and a plus-1 rating in Friday's 5-1 win over the Lightning in Game 2 of their first-round series. Columbus Blue Jackets defenseman David Savard has been fined $5,000 by the NHL for slashing. Check out the key stats to know about the Columbus Blue Jackets' pursuit of a 17th consecutive victory. The Columbus Blue Jackets have signed defenseman David Savard to a two-year contract a day after adding free-agent center Brian Gibbons. 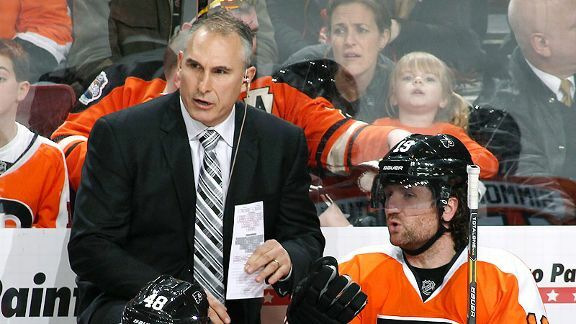 A solid coaching debut for Craig Berube, all things considered. The Philadelphia Flyers earned their first victory of the season -- a 2-1 win over the Florida Panthers -- in Berubes inaugural game as replacement for the recently fired Peter Laviolette. Looks like the Columbus Blue Jackets are forced to deal with yet another tough break. According to Aaron Portzline of the Columbus Dispatch, defenseman James Wisniewski is out "long-term" with broken bone in foot. The Columbus Blue Jackets have reassigned defenseman David Savard to their American Hockey League affiliate in Springfield, Mass. The Columbus Blue Jackets anticipate having three (up from two) regular defensemen in the lineup for Thursday's tilt with the Calgary Flames. The Columbus Dispatch implies Nikita Nikitin is expected back after dealing with an upper-body injury. With two regular defensemen nursing minor injuries, the head coach of the Columbus Blue Jackets has some decisions to make ahead of Thursday's contest with the St.
A dozen or so Columbus Blue Jackets players went through a light workout on Monday, their first unofficial meeting since the NHL and the players' union reached a tentative agreement a day earlier after a lengthy lockout.